While love can take us into many dark corners and can reveal the true meaning of the ultimate betrayal, this spellbinding story also has a heartfelt intervention and is a testimony to the good of the people that find us in our darkest hours. Today, I’ll introduce to you a new great audiobook. 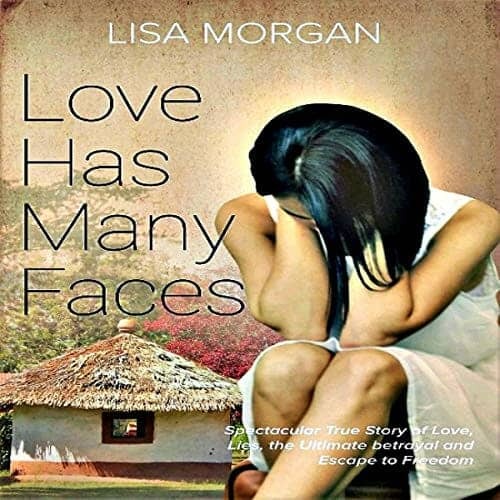 I like it and I think you like it too: Love Has Many Faces Audiobook By Lisa Morgan – Narrated by the very talented voice over actress Sarah Barbet. This spectacular true story unravels like a fiction drama. These jaw-dropping events take a British woman on a journey to East Africa. The date was set. She gave up a well-paid job in the Middle East, bound for a new life of marriage. But things quickly go sour when secrets from the past start to surface, and deceit turns the man she loves to corruption and greed. Their relationship isn’t the only thing in jeopardy; she gets tangled in a web of lies, ends up on the wrong side of the law, and is left penniless in a foreign land. Local villages take her under their wing, take pity on her, and bring more than happiness to her broken life. Nature also plays a part, giving her hope in a beautiful country that she has become a prisoner of. She remains locked in a lawless country when her situation takes a tragic blow. Find out how one woman’s strength and the sheer determination of the human spirit, fight back will all odds against a corrupt system, with incredible turning points you will not believe.